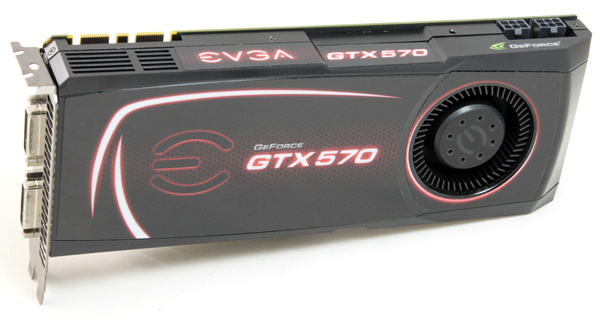 Our guest today is EVGA’s Geforce GTX 570 Superclocked, which as the name suggests comes overclocked. The card’s GPU runs at 797MHz and the memory at 3900MHz. Naturally, higher clocks mean more juice for gaming, and who would say no to that? Geforce GTX 570 is the second in line Geforce GTX 500 series card. They are currently the best Nvidia can offer and since Nvidia partners got a nod from Nvidia for overclocking, you can find plenty of juiced up GTX 570 cards on the market. Truth be told EVGA GTX 570 is not the fastest of them all, but a 65MHz overclock definitely counts it among the fastest. As you can see, EVGA offers a 10 year warranty after the registration, but it would be wise to check whether it applies for your region.